New: Click here to view in https:// (secure) mode. Tired of just lounging beside the pool of yet another impersonal hotel? Frustrated with excursions, surrounded by coach-loads of other visitors? Longing to experience the real country and to meet the real people? With our extensive local knowledge, we can help you to plan your perfect itinerary... or simply relax and unwind in our peaceful tropical hotel gardens. Relax and unwind in comfort to the sounds of tropical birds and the Indian ocean, at our friendly, family run beach hotel; run personally by the English-speaking Sri Lankan lady owner. Choose from the wide range of activities including: Swimming or scuba diving, whale-watching, visits to temples, fascinating local events and excursions. 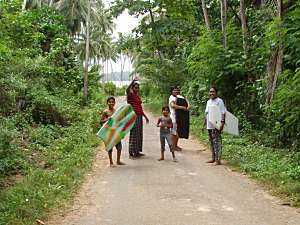 With our extensive local knowledge, we can help you to arrange your personal itinerary and to experience the real Sri Lanka. We can recommend trusted drivers & guides. 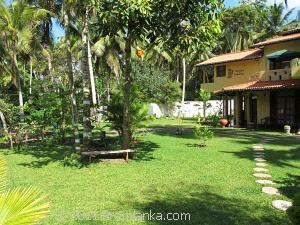 Just five double bedrooms, all en suite with private balconies, set in peaceful gardens amongst coconut palms, about 400 paces from a nice, sandy beach, near Sri Lanka's southern tip. Close to Dickwella town and to Ayurvedic centres, our peaceful Sri Lankan beach hotel is shielded from the noise and bustle of the main Colombo–Hambantota coast road. 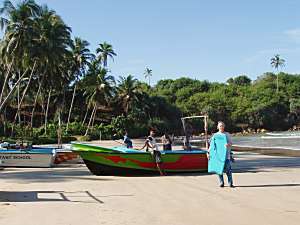 Dickwella is a coastal market & fishing town, between Matara and Tangalle; Sometimes spelt Dikwella or Dikwalle; Also called Dikwella South. 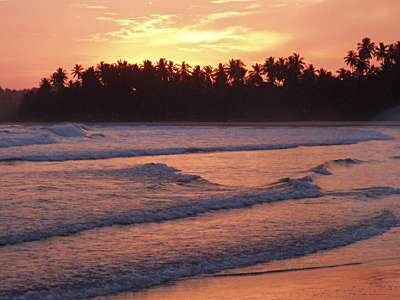 Or stroll down the short track through the coconut palms to Dickwella Beach for some evening surfing. 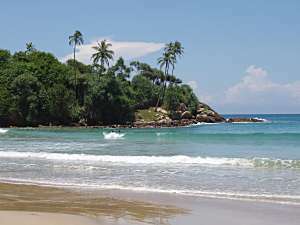 Dickwella, also spelt Dikwella or Dikwalle, means long beach. 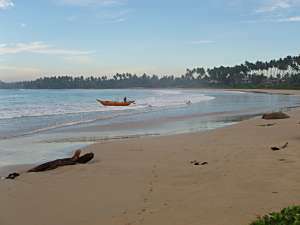 Strolling the full length of this coral sand beach fringed with coconut trees, takes about 40 minutes. 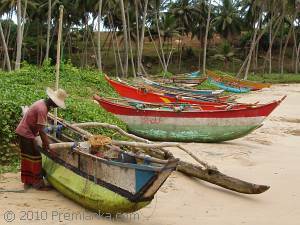 Traditional Orus & Fishing Boats, Dickwella Beach, near Premlanka Hotel. Important: We Do Not Send Spam! If you receive any "spam" emails which purport to originate from us, please delete them and accept our assurances that they are not sent by us. Unfortunately it is very easy to falsify an email address. We do not send "spam" emails. Friendly & relaxing comfort at Premlanka Hotel, Dickwella Beach, Dikwella, Matara, Southern Sri Lanka. © 2008–18. Prepared and published by Curlew Communications Ltd.